Made It Through Mum: SM Woman- SM Ladies Fashion FLASH SALE on July 21! 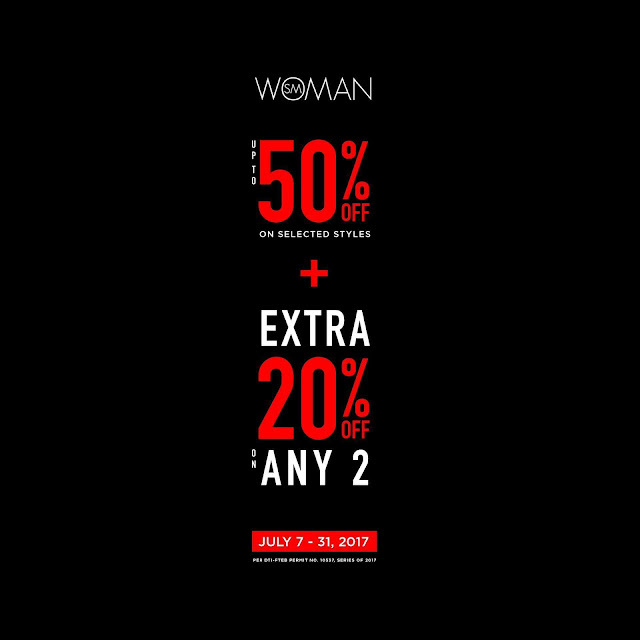 SM Woman- SM Ladies Fashion FLASH SALE on July 21! Ready your wallets, ladies! As SM Woman - SM Ladies Fashion will be having a flash sale on July 21 from 5-9PM. It’s the perfect time to amp up your closet with SM Woman’s exciting offers. And since it’s from the brand that offers fashion for every woman, you will surely find something that suits your sartorial preference, no matter your style, size and body shape. Head over to any SM Store with your shopping buddies and enjoy 30% off on regular items on over 50 SM Ladies fashion brands nationwide. And while we’re still at it, until July 31, they are giving further reductions of extra 20% off when you buy Any 2 of their sale items of up to 50% off. Isn't that amazing? So be ready to get your shop on this July at SM Woman, fashion for every woman. To know more about SM Woman, visit www.thesmstore.com, their Facebook page, https://www.facebook.com/SMWoman/ and Instagram, https://www.instagram.com/smwoman/.